Viatcheslav Zhukov completes and Andrew Barber makes it 200,000 after bringing it in. Zhukov makes it 300,000 and Barber calls. Both players check fourth street and Barber bets 200,000 on fifth street. Zhukov moves all in for 270,000 and Barber calls. "Is ace high good?" asked Barber as he tables his hand. Ace-high is the best hand against Zhukov's jack-high and he has a better low draw as well. Barber catches the on sixth street, while Zhukov catches the . Barber makes a 7-6 low and locks up half of the pot with ace-high still in the lead for the other half. "He needs to improve," said Barber as the river card is dealt. Zhukov squeezes out the on the river and he is eliminated in second place. Barber shows the on the river to improve as a formality and he secures the bracelet along with the $517,776 that comes with it. Zhukov takes home $319,989 for his runner-up finish in the event, falling just shy of his second career bracelet. Andrew Barber completes and Viacheslav Zhukov calls. Zhukov proceeds to bet fourth, fifth and sixth street before check-calling a bet on seventh. Barber tables his for a flush and Zhukov mucks. Andrew Barber completes and Viatcheslav Zhukov makes it two bets after bringing it in. Barber calls before check-calling bets on fourth and fifth street. Both players check sixth street and Barber leads out for 200,000 on the river. Zhukov calls and mucks after Barber shows in the hole, giving him trip sixes, the pot and a massive chip lead. On sixth, Barber bets 200,000 and Zhukov calls. Barber bets 200,000 on the river and Zhukov calls again. Barber tables in the hole, giving him two pair and Zhukov mucks. Viacheslav Zhukov raises to 200,000 and Aaron Barber calls from the big blind before check-calling bets on every street of the board. Zhukov tables his for a full house and Barber flashes his and mucks. Viacheslav Zhukov limps in and Andrew Barber raises to 200,000. Zhukov calls and bets the flop once Barber checks. Barber calls and then check-calls 200,000 when the turn lands the before both players check the on the river. Barber tables an , but it would be Zhukov's that would see him scoop the pot. Andrew Barber raises on the button and Viatcheslav Zhukov defends his big blind. The flop is and both players check. Zhukov leads out for 200,000 after the peels off on the turn. Barber calls and the river is the . Zhukov leads out and Barber calls. Zhukov shows and Barber mucks his hand. Viatcheslav Zhukov limps in on the button and Andrew Barber checks his option from the big blind. They see a flop of and Barber leads out for 100,000. Zhukov calls and the turn is the . Barber checks and Zhukov bets 200,000. Barber check-calls and the peels off on the river. Barber check-calls 200,000 from Zhukov and Zhukov shows , good for the nut straight and takes the pot against Barber's , giving him a set of sevens. Andrew Barber raises on the button and Viatcheslav Zhukov calls out of the big blind. Zhukov check-calls every street as Barber fires the flop, turn, and river as the board runs out . Barber tables and Zhukov mucks his hand. Andrew Barber raises on the button and Viatcheslav Zhukov makes it three bets out of the big blind. Barber calls and they see a flop of . Zhukov bets and Barber calls. The turn is the and Zhukov bets 200,000 and Barber calls. The river is the and Zhukov checks. Barber bets 200,000 and Zhukov check-calls. Barber shows and Zhukov mucks his hand. Viacheslav Zhukov raises to 200,000 from the button and Andrew Barber three-bets to 300,000. 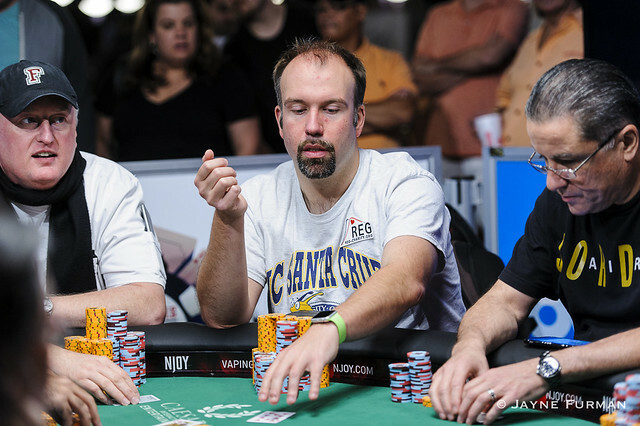 Zhukov calls and the dealer drops a flop. Barber bets, Zhukov calls and the turn lands the with Barber betting out 200,000 and Zhukov calling. The river lands the and Barber leads for 200,000 with Zhukov calling. Barber tables his and Zhukov mucks. Viacheslav Zhukov has the bring-in and Andrew Barber completes. Zhukov raises and Barber calls before Zhukov bets fourth and fifth. Barber calls fourth but then raises fifth as Zhukov calls. Barber bets sixth, Zhukov calls and both players check seventh. Zhukov tables his for a pair of fives as Barber tables his for a low and missed straight and flush draw. Viacheslav Zhukov has the bring-in and Andrew Barber calls. Barber bets 100,000 on fourth and Zhukov raises. Barber calls but then folds to a bet on fifth. Andrew Barber completes and Viatcheslav Zhukov makes it 160,000 after bringing it in. Barber calls the extra 80,000 and check-calls down every street as Zhukov bets every step of the way. Barber check-calls seventh street and Zhukov shows in the hole, giving him trip sevens and the pot. Don Zewin completes and Andrew Barber raises. Zewin calls, and then calls a bet on fourth before leading on fifth. Barber calls and both players check sixth before Barber bets seventh and Zewin folds. Barber quickly flips up the on the river and Zewin sits back down to sweat his river card. "What do I need?" asked Zewin. 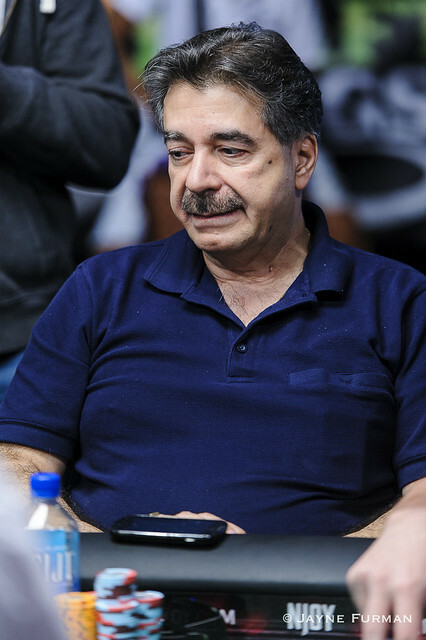 The players tell him he needs a nine or a diamond to stay alive and he squeezes out the on the river to give the pot to Barber and eliminate him in third place, leaving Barber heads-up with Zhukov for the bracelet and the first place money. Viacheslav Zhukov completes and Andrew Barber raises. Zhukov calls, and once Barber bets fourth, Zhukov raises. Barber calls, and then calls a bet on fifth and sixth before Zhukov bets his last 95,000 and Barber calls. Zhukov tables his and doubles through with aces up. Barber has buried kings, but winces a bit as Zewin shows that he made aces on fourth street. On seventh street, Barber flips up the , leaving him with just kings and Zewin doesn't even need to sweat his river card and doubles up.